I was recently interviewed about my thoughts on being a “woman artist”. It was interesting to think about and consider the questions put forth by Jay Heuman the Curator of Education at the Salt Lake Art Center. Since this month is the 30th anniversary of National Women’s History Month, it is the perfect opportunity to contemplate the contribution of woman artists throughout time. A random few of my favorites are Georgia O’Keeffe, Tamara de Lempicka, Sonia Delaunay, Vanessa Bell, illustrators Jody Hewgill, and Anita Kunz, and book artist Julie Chen. You can read the article in the Artists of Utah ezine “15 Bytes”. 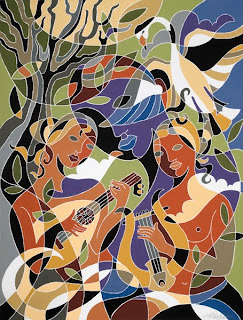 Above is my gouache painting “Lute” 30 x 22 1/2 inches.